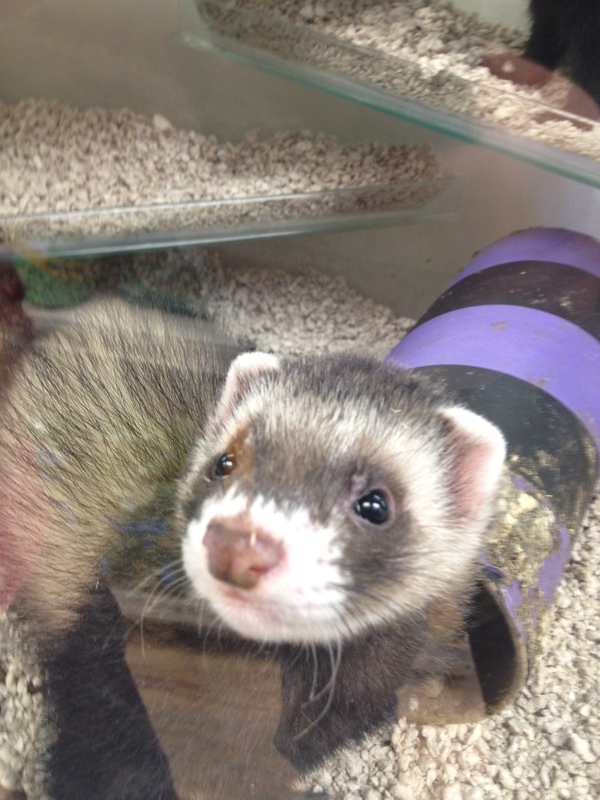 Pet shop Gloucester pet care series – ferret care. Ferrets are members of the mustelidae family (weasels, stoat, mink, otter, badger, and their wild ancestor the polecat). A ferret is basically a domesticated polecat. They have been traditionally bred to hunt rabbits and rats and generally make very good workers. Due to an imfamous TV appearance in the 1970s and ill informed owners of working ferrets, they have had a bad press with regard to biting. Ferrets can be hand tamed from three weeks and if this is done properly, do not bite. Unfortunately some people believed they needed a big, aggressive male ferret as a worker and so stories of vicious animals that lock on and don’t let go abound. Actually it is relatively easy to get a ferret to let go if it does bite but because the idiot on the TV show didn’t know how to do it the myth grew. Actually an aggressive male ferret is the last thing you want for working. This animal would be big enough to kill a rabbit in the warren and would then stay there. The owner would have to dig down and reach in to get the ferret back. You can imagine the mess this type of animal could make of the owners arm. What you want (and this is why the polecat was originally domesticated) is a nice docile little female who will chase the rabbits out but is too small to kill one and will come out to show you what she’s done. My son’s fellow breeder has one (Chilly) like this. She is his best worker and yet we have taken her to kids parties. In the end the ferret’s temperament is going to be decided by the breeder, handler and eventually owner. This is why we breed and tame our own ferrets for our pet shop Gloucester. Male ferrets (hobs) are larger than females (jills) and generally a bit lazier as well. Both make good pets. However both have their own peculiarities that need to be taken into account. The breeding cycle of the ferret throws up a couple of issues. Firstly and most seriously, a female will come into season a couple of times a year. She must be mated to bring her out of season. If left to stay in season she will become seriously ill and could (probably would) eventually die. Secondly the male exudes a waxy substance onto the skin during the breeding season. This gives the male a very strong odour. In both case neutering the ferret will prevent any problems. A neutered female will obviously not come into season and a neutered male will not smell. Ferrets can musk when threatened but a suitably tame and happy ferret will not. 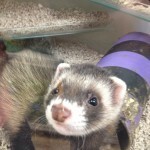 At our pet shop Gloucester we do not agree with descenting ferrets (removal of the musk glands). Ferrets are carnivores. They eat meat and get their energy from protein and fat. A good quality complete food will provide all their nutritional requirements. Our pet shop Gloucester workers are fed mainly raw food as they are used for pest control and have a plentiful supply. Our pet shop Gloucester pets are fed complete food. Both do equally well. Ferrets drink quite a lot. They should always have access to a plentiful supply of water, preferably via a gravity fed drinker (bunny bottle). Ferrets can be kept indoors or outdoors. Our pet shop Gloucester breeders are kept together outdoors as they have not been neutered. If you are considering keeping a male ferret indoors we would strongly suggest you have him neutered for your own sanity! If you are keeping them out doors then obviously you need to take into account the temperature as too hot or too cold is not conducive to good health. If the temperature drops too low you will need somewhere to bring them in or insulate their enclosure. Wherever you keep them they require a large living/play area. They are very active animals and love to play. they are also quite sociable and are best kept together. If you can only keep one then you are will need to realise you will have to be the other ferrets and will need to give yours lots of attention (in much the same way as you do a dog, another social animal). A large run/pen should be provided for them to play in, big enough for you to put in plenty of toys/equipment. Ferrets love ramps, tunnels etc. If left in an outdoor enclosure they must have refuge from the sun as they can suffer from sun stroke. Dust free shavings are good as a floor substrate, or paper pellets etc. Ferrets can be litter trained and a corner litter tray is probably the best investment you can make. Clean the cage once a week and the litter tray daily. Make sure you use a pet disinfectant, not household. Also provide some nesting material for them to curl up in their nest box. Hammocks and shelves are a good idea for them to lounge around on. Some ferrets like to swim in water and a cat litter tray used as a pool in their run is often appreciated but not essential. The first thing you will notice when handling a ferret is that they are very bendy. They can completely turn around in a tunnel the same width as their own body. Holding onto one that does not want to be held can be a challenge. The most secure way to hold a ferret is to place you thumb across the shoulders so the ferret’s forelegs are between your first two fingers. You can support the rear of the body with your other hand. Holding this way prevents the ferret twisting and turning and is quite comfortable for the animal. They have been known to fall asleep in this position but then again there is probably not a position a ferret won’t fall asleep in! They like to sleep and can be quite difficult to wake up if they are in a deep slumber. Ferrets can catch canine distemper. We recommend you get your ferret vaccinated. We have already discussed the need for neutering (alternatives are jill jabs but these hormone injections can be expensive over the life of the animal). Female ferrets will get ill if consistently allowed to come into season without being mated. Diseases such as septicemia, leucemia etc. are very serious and often fatal. A healthy ferret will live on average 8 – 10 years (remember this is an average, some will be less, some more). Obviously ferrets can suffer with other diseases, some of which can be contracted by humans, so hygiene remains important. Ferrets are carnivores, so they do not mix with prey animals. They will kill and eat rabbits, rats etc. They can mix with other, bigger carnivores, such as dogs or cats. This however depends entirely on the cat or dog. I have customers who’s ferrets play with their dogs, the ferrets being in charge. However my dog would certainly kill a ferret, straight away on introduction. You have been warned, it is better not to take a chance and to keep them separate. A few do’s an don’ts to round off. Do seriously consider getting your ferret neutered. Do provide plenty of space and activities. Do get your ferret vaccinated. Do take it our for a walk on a harness and lead. You’ll make lots of friends and the ferret will keep it’s claws worn down. Do come and ask us if you have any queries at all. Don’t allow a female ferret to repeatedly come into season, this is cruel and ultimately fatal. Don’t allow a ferret near you face. They play by nipping “gently” at each others ears, noses etc. and pulling on their loose skin. Gentle to a stiff fur covered ferret is not going to feel gentle to your nose or lip, or the tighter skin of your face. Don’t allow your ferret near young children. The ferret is probably fine, it’s the child you have to worry about. Sticking a finger up the nose or in the eye of a normally docile ferret may well induce it to bite. The same is true for all animals of course. Don’t feed milk to a ferret. Like other mammals, once weaned they do not drink milk ever again and can be very intolerant of lactose. Don’t listen to the fools who say things like “Oh, we used to have ferrets, yeah if they bite just stub a cigarette out on their nose, that’s how you stop them”. No it isn’t you idiot, apart from being cruel it is also illegal. Ferrets do make good pets but you do need to do your research first. Call into our pet shop Gloucester for advice. This entry was posted in Ferrets, How to, Pet care, Pet Shop Gloucester Blog Roll, Top Tips, Uncategorized and tagged angell pets, care sheet, ferret, ferret care sheet, gloucester pet shop, gloucester pet shops, how to tips, pet care, pet shop, pet shop gloucester, pets, pets for sale, pets shop gloucester, top tips by rangell. Bookmark the permalink. Ferrets are seasonal breeders so we do not have any yet. However the season is well under way and ours are now pregnant by a week or two. Gestation is six weeks and then we would not sell them for another seven to eight weeks after that. We have to wean them and hand tame them first. Call me on 01452 501882 for more details.